Every day we are challenged to honour commitments to ourselves and to others. How we respond to these challenges affect the outcomes produced. Learning from how we respond is a powerful pathway for growth. I learnt the following lessons in engaging with a commitment I made to myself to exercise for 30 minutes every morning on my treadmill at home. For the most part, my first thought before exercising is “I don’t feel like it” especially in winter when it’s cold and dark and the bed is warm and comfortable. • When I don’t let that feeling stop me and I start walking, how I feel changes and I’m now motivated to continue. Feelings come and go and I can affect how I feel by the actions I take. • When I’m doing anything uncomfortable, I won’t usually feel like doing it – it’s an instinctive response that has me avoid discomfort which in some way feels threatening. However, I find if I take the next action in the face of the discomfort, the discomfort will eventually disappear. If I don’t, I entrench the feeling of discomfort which makes it even more difficult to get up and exercise the following day. In fact, if I continue to act consistent with the initial feelings, I stop exercising all together. 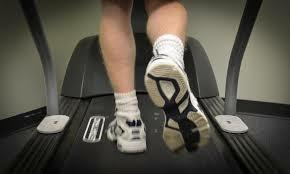 When I first started on the treadmill, I started at a speed of 5 and an incline of 4. It felt difficult and there was many a time when I wanted to reduce the speed or the incline, or walk for a shorter amount of time. My intention was to incrementally increase the settings so as to elevate my fitness levels and burn more calories. Every time I increased the incline or speed by a small amount, say an incline of 5 or 6, it felt like I couldn’t do 3 minutes at that level let alone 30 minutes. However, I found that if I kept going and managed to do 5 minute intervals, each time I completed 5 minutes, I was motivated to do another 5 minutes and eventually complete the 30 minutes. Each time a new ‘reality’ gets created and after some time it just becomes the new norm. After 4 weeks, I now exercise at an incline of 8 and a speed of 5.5 for 35 minutes. The number of calories I’m burning has increased by 50%. • How you feel and the thoughts you have do not reflect what you are capable of. You are capable of going beyond what you feel is comfortable. What you think is real does not necessarily match what is ‘actually’ real. • Be clear of what your end game is and always keep it in mind, then focus on the steps required to get you there. Manage each step and you will get there. Leaders must continuously evolve in order to provide what will make the most difference to their organisation, employees, customers, and the communities in which they participate. Evolving will take you outside your comfort zone and the kind of feelings that come up will want you to get back to what is more comfortable i.e. avoid feeling that way. In an article by Kathy Caprino on pushing past your comfort zone, David Van Rooy, Walmart’s Senior Director of International HR Strategy and Operations shares that it’s important for today’s leaders to push themselves out of their comfort zone to be successful in their careers. 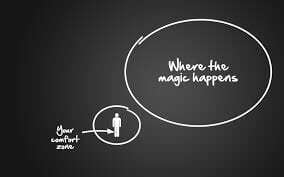 It is requisite in the work that I do with executives and leadership teams that they go beyond their comfort zones and that we come from the view that people are capable of going beyond their comfort zone and are way more capable than they sometimes feel. So when confronted by discomfort and wanting to go back to being comfortable, keep in mind that you are capable of going beyond these feelings and surviving, just focus on what the appropriate next action is and take that action – see what happens. PrevPreviousWhen is a team not a team?